Freddie Freeman may have put it best. "No doubt in my mind that he was going to come through," the All-Star first baseman said after the Atlanta Braves' latest walk-off win. 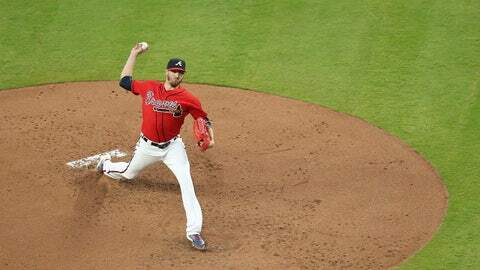 "Winners come through and Dansby (Swanson)'s a winner." Especially for this team, and especially against the Marlins. 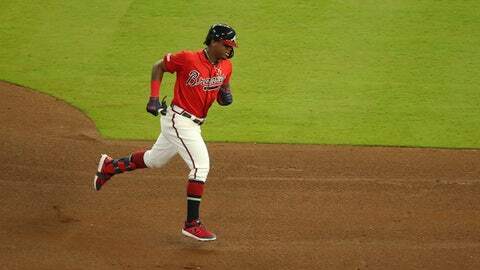 The shortstop's bases-loaded single in the ninth gave the Braves a 4-3 win over Miami on Sunday, the second walk-off hit for Swanson vs. the Marlins and the seventh in 17 home victories over the NL East rival. The late magic put a cap on a 5-1 homestand, but as we kickoff this week's Three Cuts, this run was ruled not by the Braves' offense, but by some dominant starting pitching. 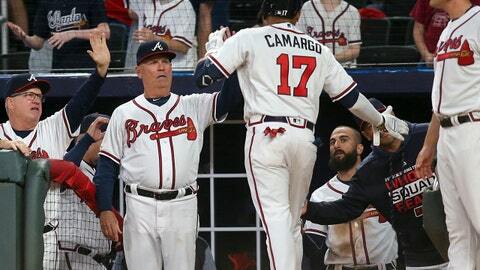 After getting burned for a 7.11 ERA in a three-game sweep vs. the Phillies, the Braves rotation -- which was down Mike Foltynewicz, Kevin Gausman and Mike Soroka in Philadelphia -- stood tall during the six-games at SunTrust Park. Atlanta starters put together a 1.29 ERA in 35 innings vs. the Cubs and Marlins and is that much closer to full strength. Kevin Gausman is back, tossing seven scoreless innings in his season debut vs. the Marlins, Foltynewicz is likely one more start at Triple-A Gwinnett from his return and Mike Soroka looks like he won't be long for Atlanta after after five hitless innings with seven strikeouts in his debut for the Stripers. The recent success and those reinforcements begs the question as to how exactly Snitker is going to utilize his rotation options outside of Foltynewicz, Gausman and Julio Teheran over the coming weeks? Sean Newcomb -- in a crucial outing with proverbial footsteps behind him -- turned things around after a rocky second inning Sunday with seven innings in which he allowed four hits and two runs, and if his spot was ever tenuous, it's feeling less like after Sunday. Then there's Fried, who may be the most intriguing arm in the Braves staff, as he now has a 2.54 ERA in 10 career starts compared to 3.80 in his 16 relief appearances. That ERA is the third-best since 1990 for any pitcher through the first 10 starts of his career. He's due a longer look in the role and is scheduled to make a start Tuesday at Coors Field -- where his ability to throw that looping curveball will be tested -- which is the same day Foltynewicz will make his next, and presumably last, rehab appearance. 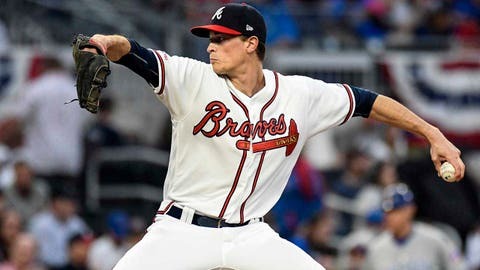 Between Fried, Kyle Wright (two earned runs over six innings vs. the Marlins on Saturday) Soroka, who may be hard to keep down if he keeps this up, Touki Toussaint and Bryse Wilson, this was always going to be a fluid situation and of benefit in using the final spot in the rotation as a shuttle service between Atlanta and Gwinnett. But what if Fried can maintain this level of production? How long of a leash will he have in the starting five? As the mainstays return, finding opportunities for those young arms may prove the biggest challenge and the biggest luxury for Snitker. The trickle down effect of the Braves acquiring Josh Donaldson -- whose best production has come with him hitting second in the order -- was in Ronald Acuña Jr. sliding to fourth as that sought-after right-handed power bat behind Freeman. While there have been moments, including a ridiculous two-run home run on a down and a way changeup on Friday night, there have been struggles early on with the reigning National League Rookie of the Year's transition to cleanup. After Sunday, he's hitting .129/.289/.323 with two homers as his lone extra-base hits. He's swinging at fewer pitches in the zone less than last year (67.2 compared to 72.8 in 2018) and is making contact nearly 10 percent less (72.1 to 82.7). But he already has seven walks, a 17.5 percent rate (that was at 9.2 in '18) and if you want to focus on just one stat after his first 40 plate appearances, it's Acuña's BABIP. That sits at just .087 BABIP despite 12 hits of 95 mph-plus, which is tied for 24th, just one behind the Angels' Mike Trout (.286 BABIP). Last season, at age 34, Nick Markakis played all 162 games for the first time in his career. The iron man run came with the right fielder following a 133 wRC+ firs half with an 88 after the break, including 81 in August and 83 in September. Even Freeman wasn't impervious to a dip late in the season amid his playing every game, hitting 15 percent above league average in August, and in the final month, the entire Braves offense compiled an 88 wRC+ (19th in MLB). Resting players was a topic of both general manager Alex Anthopoulos and Snitker this offseason and early on, we're seeing it in practice. Sunday, Markakis was out of the lineup, the earliest date he'd missed a game since his debut in 2006. In the first nine games we've also seen the 33-year-old Josh Donaldson -- who hasn't had a fully healthy season since 2016 -- and Ender Inciarte out of the starting lineup. We've yet to see Freeman, who unless injured has played no fewer than 147 games since 2011, have a rest day. But that it's happening for others is a very positive sign. Snitker has made comments before about how some players have been harder than others to give a day off, but it's clear that rest is a real part of the gameplan for 2019.